~ Reflections on my time on the dance floor or otherwise engaged in dance related activities. The Power of the People? Word is that we have gotten Stanford’s attention! No-posts-in-the-dance-studio update: Thank you everyone for your show of support. Within one day of mentioning this problem, over a dozen friends offered to contribute toward the solution, then friends of friends further spread the word. But ideally, Stanford itself should prioritize a more functional dance studio, i.e., without metal posts in the middle. It now seems that this will likely happen. Yesterday I exchanged several e-mails with the key people in the Dance Division and Drama Department, telling them about this support from concerned dancers, and it looks like it has already made a difference. Dance and Drama asked us to hold back and wait a week or so (i.e., no fundraising just yet), so they can talk to those making the final decisions. Apparently this interest, from the dancers themselves, will likely convince Development that this is an important issue. So between Stanford prioritizing a post-less studio (now the most likely outcome), and our dance community coming through if Stanford doesn’t, it looks like they will choose the construction plan without posts. Yay! I’ll let you know if we end up needing your contributions, but so far it looks like your offers alone are solving the problem. So, if you haven’t contacted Stanford Dance and Drama to let them know how you feel about the posts, please do so asap! I’m working on finding a contact phone/email other than just the Roble front desk, so if anyone has any suggestions, please let us know! First of all, the book signing was amazing. Second, Jammix was also amazing. Look for a post about that in the next couple of weeks. If you can help, know someone who can, or think you might, PLEASE pass the word along. I’ll be keeping up with developments and we may or may not be starting a kickstarter/indiegogo campaign to try to crowd source removing the other post. That depends a lot on how long we have before they have to know which set of plans to use. Generations of dance students will be forever grateful if we can pull this off. This includes past generations like me, and future generations. Think of the proto-dancers! I’m going to try this new thing where on Fridays I post something that has popped up on my FB feed that pertains to dancing and made me smile. I don’t of course expect these things to be new, most will have made the circuit before, but I like the idea of having these things all in one place for me. This is from a blog “Just Girly Things” I don’t really go in for pintrest, and certainly not for this board, but this style of picture seems to be pretty popular, and this one in particular made me smile. It is lost in the transfer, but the original caption is “Country music <3”. For those of you who don’t know, I’m a big sucker for country music, even if far too little of it is deemed worthy of dancing to by my fellow dancers at FNW. Maybe it’s time I tried WCS? 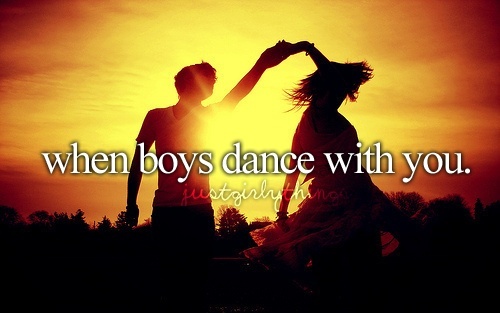 This image also makes me smile because it seems to imply that it is unusual for guys to dance with girls. One of the things I love about the social dance community in the SF bay area is that there is no shortage of guys dancing with girls. Or of guys dancing with guys, or girls dancing with girls. We all dance with each other and have a great time of it. The image seems to me to say that it is special because it is rare. I think it is special because it isn’t. Well, I guess what I really think is that this dance community is special because it isn’t rare for guys to dance with girls here. This is a book that Richard Powers and Nick Enge have written together. Release party and book signing tonight before Jammix. Second book signing party on June 7th at FNW. If you are anywhere in the bay area and can make it to either event, you definitely should. I am so excited for this book! Once I get a copy and read it, I’m sure I’ll have lots of neat things of my own to say about it, so expect posts in the vague, undefined future about it. A Peers I Actually Enjoyed? I’m not sure what happened, but I’m glad it did. I went to the May PEERS event (Sherlock Holmes Theme) and actually had kind of a good time. Usually I end up leaving PEERS events in tears or at least borderline, but this time, I actually kind of enjoyed myself. I know that the last time I talked about PEERS I pretty much swore I was never going to another PEERS event. But then I learned that PEERS wasn’t sure it was able to maintain it’s events, or even possibly the rest of this season due to monetary issues. And then my boyfriend was pretty excited about the event. The combination pushed me into going despite not having much hope I was going to enjoy it. Maybe that was the trick? Assuming I was going to have a miserable time meant I wasn’t expecting anything and so I did in fact have a good time. I didn’t get many dances with strangers, but people I knew from FNW actually asked me to dance at PEERS this time. It was a nice change; to not feel ignored by people I would count as friends in another environment. Idk, the thought still kind of leaves a bad taste in my mouth. I hope to see you guys there in June! Can you spot yours truly again? That probably depends on whether you have the patience to sit through the video till almost the end.